I live about an hour from Albuquerque, but I rarely go there, unless I’m picking somebody up from the airport or flying elsewhere. What can I say, I’m a country person and ABQ is kind of just a big city. When I’m in need of some culture and cuisine, I’d rather go to adobe-quaint Santa Fe, the “City Different”. So while ABQ isn’t really my kind of place, people have lived in the Rio Grande Valley in the shadows of the Sandia Mountains for thousands of years. 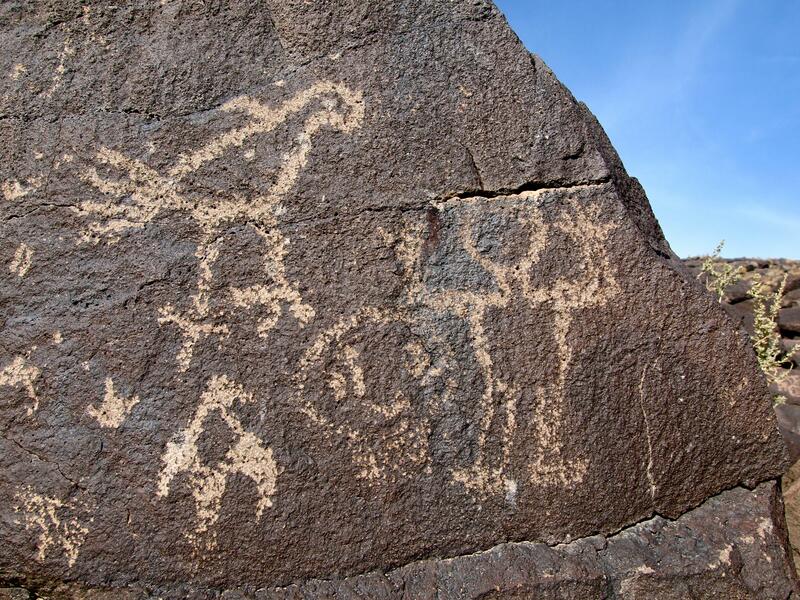 West of the city, an escarpment of black volcanic rocks bears some 24,000 petroglyphs painstakingly pecked into the rocks by the Ancestral Pueblo People. Today, the petroglyphs are protected as a National Monument by the National Park Service and the site is still considered sacred by the descendants of the Ancestral Pueblo People, including the Cochiti, Jemez, Sandia, Santa Ana, and Zia tribes, who believe petroglyphs represent a connection between the present and the past. 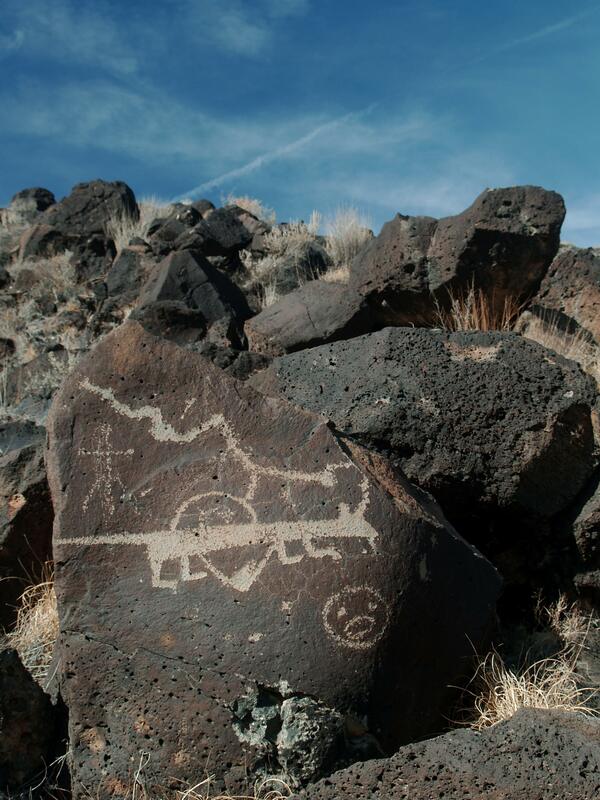 The Petroglyphs may be ancient, protected and sacred, but that wasn’t enough to save them from that modern god Suburban Sprawl: In 2007, a four-lane highway was bulldozed through the monument. Hundreds of carvings were cataloged, mapped and removed before construction began, but the Native people still consider the highway a desecration. I love petroglyphs. Every time I find rock art, I feel a deeper connection to the rocks, the land and the people who came before me. Petroglyphs evoke thoughtfulness. Etching in rock is not easy and I always wonder what called the person to spend hours chipping away at dark rock to leave a lighter bird, snake, face, or abstract design. The meanings of petroglyphs are usually a mystery, but there are hints that some might reference major geologic events like earthquakes. Zigzagged lines are thought to represent snakes and serpents, creatures commonly found in Native American legends about geologic unrest. Knowing when a fault’s last major rupture occurred can tell geoscientists a lot about a region’s level of risk for the next Big One. But seismometers — instruments that record ground motion — have only been around for about 100 years, so scientists seeking information about older earthquakes often have to get creative. For as long as people have envisioned an underworld, their stories have been shaped by geologic unrest and while some cultures communicate their spiritual beliefs in words, others depict them through art. In California, spirals and jagged lines rendered on rock walls hint that Native Americans were also deeply affected by the Earth’s rumblings. 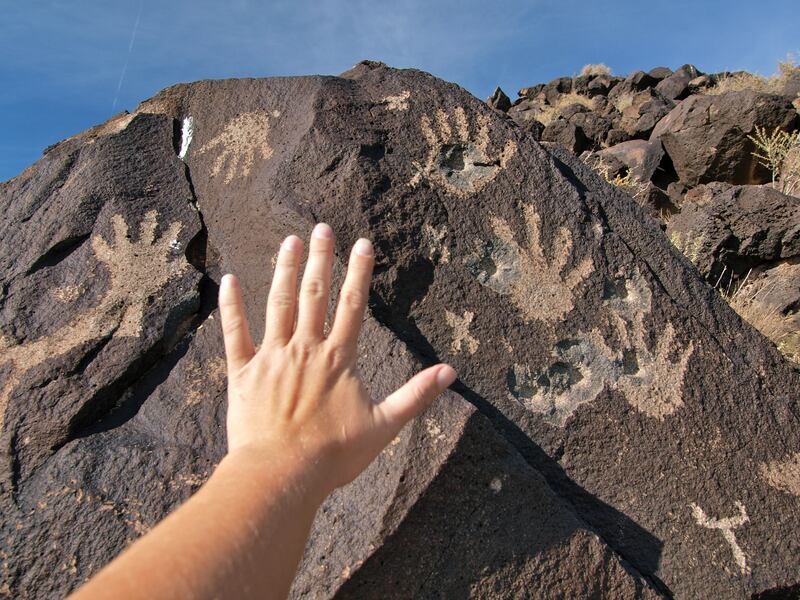 “It’s no coincidence that California’s most spectacular petroglyph sites tend to coincide with the state’s most spectacular earthquake and volcano sites,” says Susan Hough, a geophysicist with the U.S. Geological Survey in Pasadena, California. 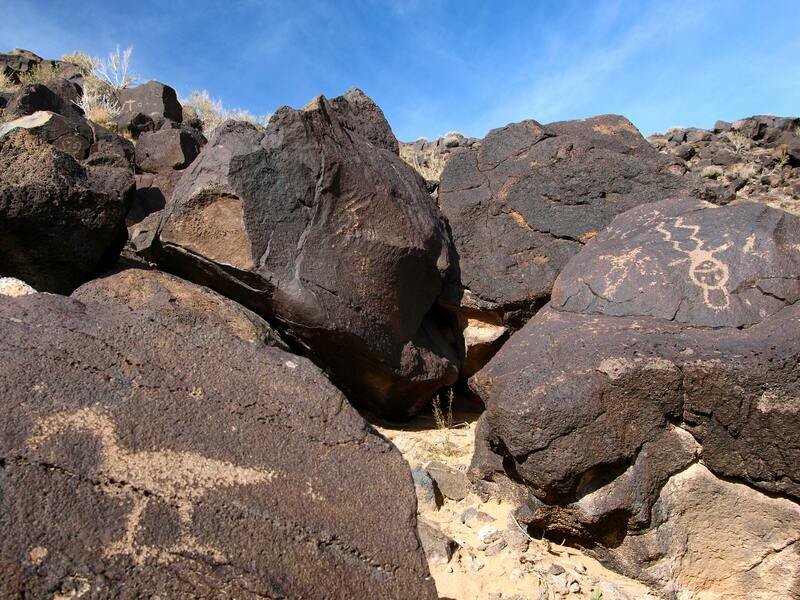 For example, the Coso Geothermal Region in the northern Mojave Desert is known for being both one of the most prolific petroglyph sites in the state and also one of the most seismically active, with a higher number of “felt” earthquakes over magnitude-3 than anywhere else. 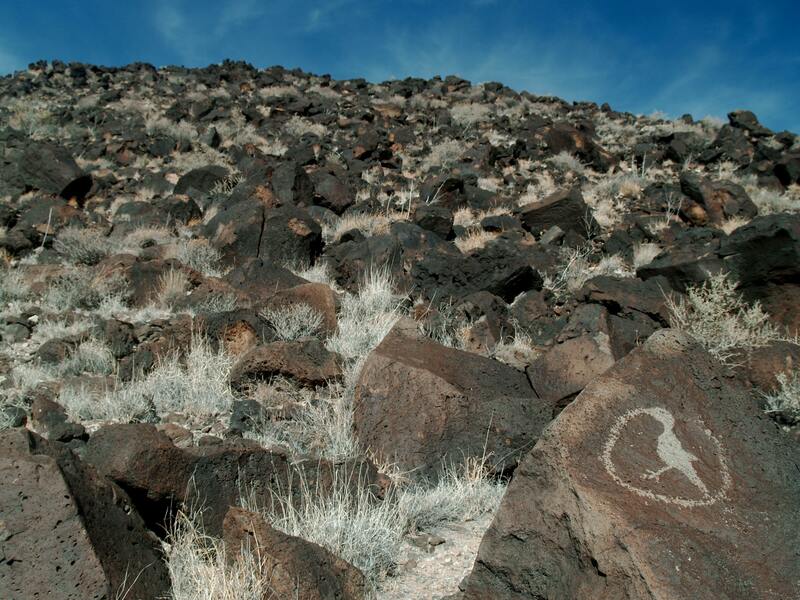 Another remote site in the Mojave, particularly rich in petroglyph art sits nearly on top of a section of the San Andreas Fault that ruptured in 1992, producing a magnitude-7.3 earthquake. “The age of the last big earthquake in this region is very close to the age of the oldest petroglyphs at the site,” Hough says. “The association between petroglyphs and earthquakes is difficult to prove, but on some level it seems self-evident,” Hough says. California’s earliest residents would have certainly experienced earthquakes and petroglyphs seem to be one of their primary forms of expression. “It would be more surprising if earthquakes did not figure prominently,” she says. Albuquerque is a geologically active region, evidenced by the five now dormant volcanoes dotting the city’s skyline. Who’s to say whether the spirals and zigzagged lines on the black volcanic rocks are testaments of earthquakes past, but with all the effort put into petroglyphs, perhaps they’re more than mere doodles. 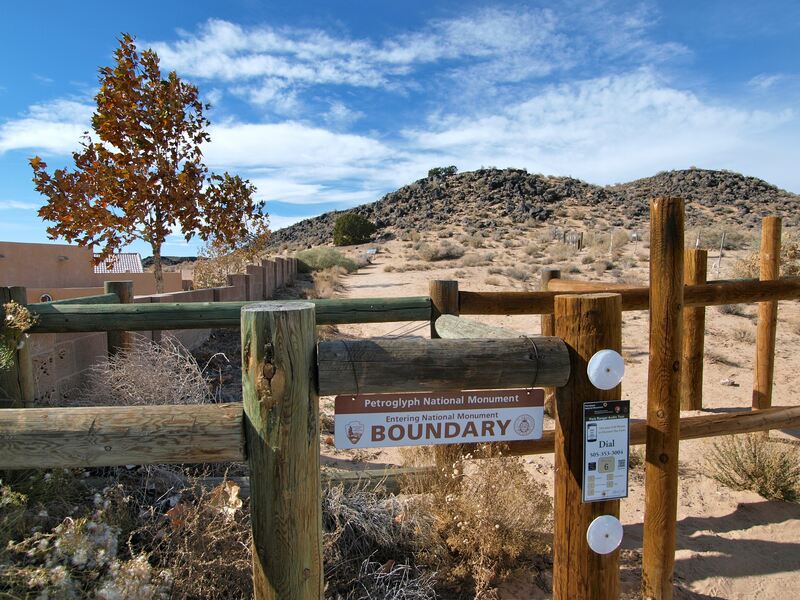 All of these photos were taken along the Rinconada and Pietras Marcadas Canyon trails in Petroglyph National Monument. For more petroglyph photos taken elsewhere, check out my previous posts On the Road, Again: Southern New Mexico Loop and All the Pretty Horses. This entry was posted in Bowie & D.O.G., Hiking!, New Mexico, Photography, Road tripping!, Uncategorized and tagged petroglyphs. Bookmark the permalink. I’ve been here, too! It was a gentle, leisurely stroll through ancient history. It felt very sacred. Thanks for sharing.